Tooth Fairy | Have kids, they said. It'll be fun, they said. 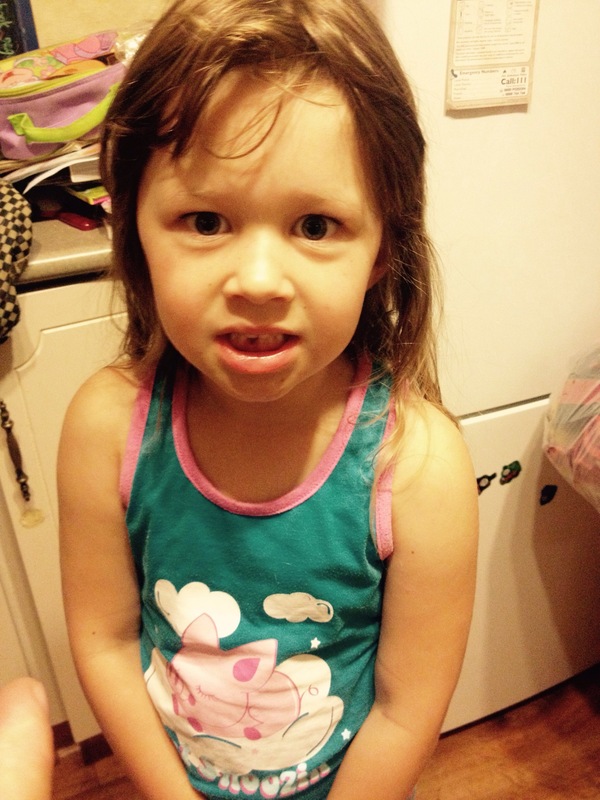 Young Princess has wanted a wiggly tooth ever since we spend a week camping with her cousins a few years ago and she witnessed her then-6 year old cousin wiggle her tooth. I tried to convince her that teeth came out when they were ready, and to please not try too hard to wiggle teeth prematurely. Fast forward to before Christmas last year, when Princess started to complain of a sore tooth. Now, alarm bells ring when teeth are sore, so I tried to get her in to see the dentist. But, the next day the pain was gone and the tooth was clearly wiggly. So, I made sure I had a shiny $2 coin in my wallet (you know, for the Tooth Fairy) and I waited. And waited. Weeks, quite literally weeks passed with nothing changing. Princess would show everyone she could, and take every opportunity she could, to tell everyone and anyone that she had a wiggly tooth. Often she would simply point to her mouth and say, “look”, which was met by a polite “oh, wow!” followed by a blank stare at me. “Her tooth is wiggly” I would whisper to them. And then roll my eyes like any good parent would. The $2 coin was spent, incidentally, a couple of times over those long wiggly teeth weeks. One evening, I asked to see this wiggly tooth and check on it’s progress. And, low and behold, right behind the wiggly tooth, was the tip of the adult tooth. Oh, crap. What did that even mean??????? See, there are things that happen in parenthood that seem natural and you just know what to do. And then there are times like this. Thank heavens for Dr Google and Dr Social Networking. We decided the front tooth should probably come out, and we tried to wiggle it but (a) that sucker wasn’t budging and (b) plot twist: wiggling teeth makes Mummy feel squeamish. So we left it, and said if it wasn’t out by the end of the week, we would take her to the dentist. Now, here’s the thing. How can a Tooth Fairy deliver a cash payment in exchange for a tooth placed beside the bed (or, under the pillow!) when (a) Mum and Dad were on their way to bed, (b) Princess wouldn’t be in a deep enough sleep for another hour at least, and (c) Mum had foolishly spent the Tooth Fairy’s money just that afternoon on car parking. So, we informed Princess that the Tooth Fairy had a cut off time. If the tooth isn’t out by bedtime, you have to wait another night. The Tooth Fairy is just too busy for that. The next night (after a day long of looking at her tooth, inspecting her tooth, making You Tube videos about her tooth, showing everyone her tooth …) the tooth was placed delicately into an egg cup beside her bed. And in the morning, what do you know! Actually, it wasn’t the morning so much as it was 3am, but still …. a teeny weeny little envelope was there in place of the tooth. 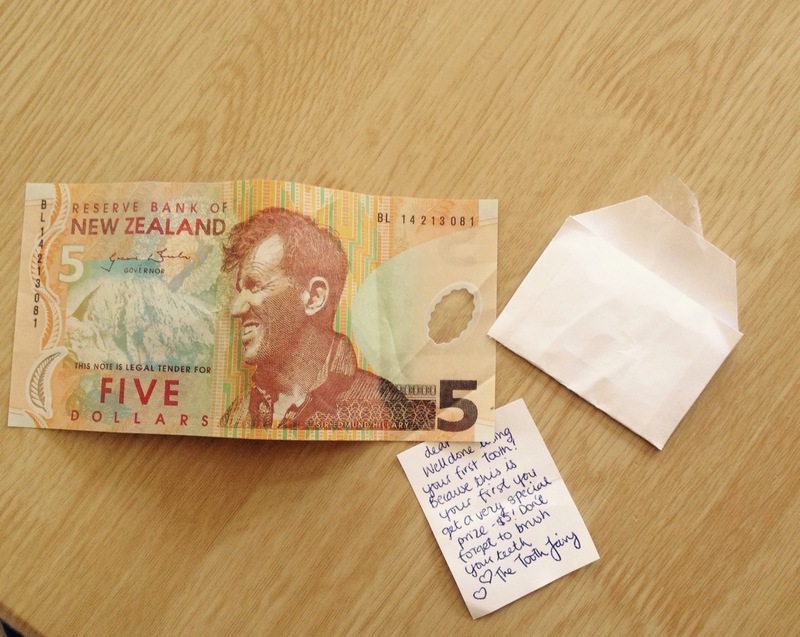 And in that envelope, a little note from the Tooth Fairy, and a crisp, folded $5 note. Because it was the first tooth, it warranted a decent payout. Said the Tooth Fairy. My mother commented that $5 was a high benchmark and to remember there are 20-odd teeth to come out. To which Mr T replied, I only had four teeth out, what kind of weirdo children did you have? To which I replied, you egg, of course you lost more than four teeth! And so, here we are. As of today, Princess informed me she has four wiggly teeth now. Four. Lucky this tooth fairy has a supply of 50c coins, ready to go.